If you're looking for a way to add extra zing to a cocktail, look no further than Fee Brothers Celery Bitters, the latest addition to Fee Brothers' Bitters portfolio. Demonstrating distinct celery notes, with background garlic and spice flavours, Fee Brothers Celery Bitters will take its place in the range as an exciting new ingredient for professional and amateur mixologists alike, and cooks who want to experiment and add a dash of intrigue to dishes such as salads, soups, grilled fish and bubbling hot cheese on toast. Celery bitters were produced in the nineteenth century by several different companies, and are occasionally cited in older recipe books, but the decline of bitters in the twentieth century sealed their fate and celery bitters were phased out. 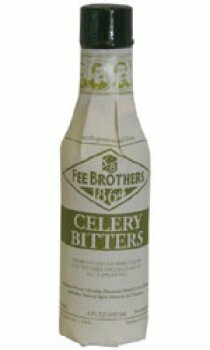 But with a renewed interest in all things retro, Celery Bitters are making a comeback and will join classics such as Orange Bitters, Rhubarb Bitters and Old Fashion Bitters in Fee Brothers' range of top-class Bitters.